Fiona Blyth is a Professor of Public Health and Pain Medicine at the University of Sydney. 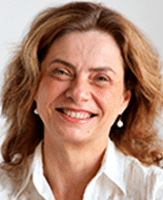 A public health physician, pain epidemiologist and medical educator, she is currently Head of the University of Sydney Concord Clinical School at Repatriation General Concord Hospital, and Associate Dean within the Faculty of Medicine. She is internationally recognised for her work in characterising the burden of chronic pain conditions within populations and has been involved in studies of chronic disease epidemiology (with a specific interest in pain-related conditions) for more than 15 years. This includes large prospective cohort studies, RCTs, pharmaco-epidemiological studies, and health services research using linked routinely collected datasets. Professor Blyth is Senior Advisor in the Knowledge Exchange Division at the Sax Institute. In this role she had extensive involvement with knowledge brokering, and training knowledge brokers. She was awarded an AM on Australia Day 2018 for her significant service to medical research and education in the fields of public health, pain management and ageing, and to health policy reform.